Thank you so much for joining my Monsters and/or Aliens Challenge. I had a blast visiting your blogs. I love the cute little scene and the googly eyes really add that little something extra. I love the creative fold of this colorful card and the monsters are adorable. I love the masking and the glossy finish on top of those sweet little monsters. Such a fun birthday card. Be sure to join our next challenge tomorrow. 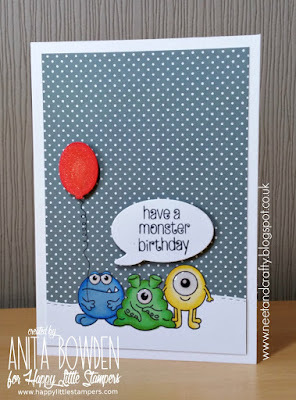 Hello Tanja and thank you for picking my Monster card as a Top Three, this was such a fun challenge, I enjoyed coloring this cute little guys. I love the "Back to School" challenge so I will start thinking what to make.